"... 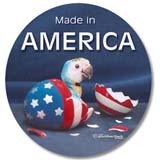 I've ordered Calcium Plus and Feather Fast for months now, and since then, my birds *lovebirds, parakeets, zebra finches and a nanday, have the richest, sleekest feathers, and none of the females have trouble laying eggs. So, thanks!" Feather Fast is dietary supplement of high potency vitamin, mineral, amino acid and concentrated protein designed to aid and promote successful molts in all birds. Feather Fast provides a broad spectrum of nutrients necessary to produce vibrant, brightly colored, healthy feathers in all birds. Directions: One pinch per bird per day during the molt, or one ½ teaspoon per day on fruit, vegetables, soaked seed or softfood for 20 pair of finches, 10 pair or cockatiels, or 6 pair of greys. 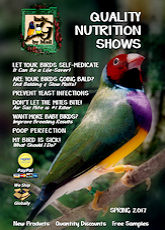 Feather Fastworks best in combination with Morning Bird�s Calcium Plus. When using this product, discontinue using any other vitamin-containing supplement. I purchased Black Jack from a local pet store. I felt so sorry for him. He looked like a very sad Vulture. 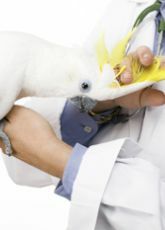 After reading your Molt and Balding articles, I placed Black Jack on both Liquid Iodine and Feather Fast. I couldn�t believe the results! I had to share them. "...I gave him the Feather Fast on his greens and Iodine in the water as you suggested every day for three weeks. I stopped the iodine dosage after the first three weeks. He continued receiving the Feather Fast on his fresh greens. I can�t believe my eyes! Black Jack thanks you for all your wonderful support." 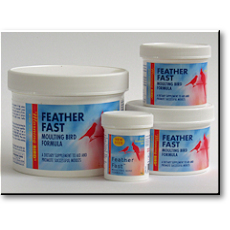 Feather Fast - a dietary supplement of high potency vitamin, mineral, amino acid and concentrated protein designed to aid and promote successful molts in all birds. Feather Fast provides a broad spectrum of nutrients necessary to produce vibrant, brightly colored, healthy feathers in all birds.